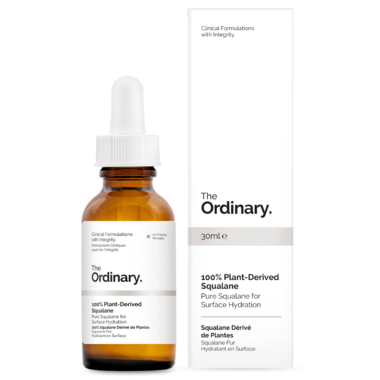 The Ordinary 100% Plant-Derived Squalane is a lightweight solution to support healthy hydration. Squalane is a saturated and stable hydrocarbon that is found naturally in the skin. It has very high emollience, is an exceptional hydrator and can prevent ongoing loss of hydration that impairs dermal suppleness. Squalane is non-comedogenic and is suitable for use on all skin types. It can also be applied to hair to increase heat protection, add shine and reduce breakage potential. Directions: Apply a few drops daily or as needed to entire face, ideally after water-based treatments. not irritating, wonderful for my itchy eczema-prone face. Has been working great to battle dry winter skin. Winter is always so hard on my skin and this has been EXACTLY what I needed. It absorbs so well into my skin and all the dry patches are gone! This oil cured my daughters cradle cap after one application! Also a great light weight oil at an affordable price point. I just started using this product because my skin is super dry this winter! Iâ€™ve been putting it on at night time after washing my face & then using my jade roller and I love it so far. It seems very hydrating. Iâ€™m hoping itâ€™ll help with my eczema. Iâ€™ve been using this and the scalene with retinol for 2 months now. My skin is better than itâ€™s been in years. No break outs! Someone commented today how good my skin looks! And Iâ€™m 57! I will definitely keep buying it. This absorbs quickly into the skin and leaves skin feeling hydrated. For someone with dry skin like me, I would not use it alone. Overall, great product for its price! Absorbs quickly! I put it on in the morning under my moisturizer. My face isn't greasy through the day, it's just added moisturizer. GREAT price! Absorbs so well! I use it under the moisturizer and it does the job in the winter! I haven't used this on its own yet, but I do add it to my regular moisturizer when I need a hydration boost in the winter. Nice consistency and well-priced. This feels really nice on my face. It absorbs quickly and leaves my skin baby soft. I usually experience flakiness in the winter months and this has helped immensely. I like to rotate between this, the hyaluronic acid, and the rose hip oil. This is a good moisturizer although it leaves a shine. Amazing face oil, quickly absorbs, doesnâ€™t cause any breakouts for my sensitive skin. My husband even started using it, really helps with the dryness from the cold weather. Loooove it on my hair!!! I apply very little on my still wet hair ends and it works fine. Also, doesn't dry it in long terms as all other product do (so called silk and so on). If accidently I used to much product, just use a little bit of talk powder or starch to cancel the oily effect. 10 stars out of 5. This product is amazing. If you use a little, it keeps your skin super hydrated without looking too oily. And it hydrates while feeling lightweight, like nothing is on your face. Itâ€™s also safe for fungal acne. I will be repurchasing this for life. This stuff feels delicious. It's not too heavy, and sinks in nicely. Easy to apply and very hydrating/smoothing. I have really dry flaky spots (eczema) that get worse in the winter. This stuff feels amazing from the instant you put it on. This is one of the only products that saves my skin when using prescription topicals such as tretinoin and azelaic acid. After a while of use I felt like my skin soaked the squalane in way better but it's totally a non-fussy oil that is cosmetically elegant and easy to fit into a routine, can't live without it now! I have very sensitive skin that becomes very dry in the winter and this product has completely changes that. It's mid January and I have had no issues with dryness, redness or irritation! I have extremly sensitive skin and the last few winters gave been a struggle with ever increasing dryness and irritation. This product has helped make a big difference. I've tried more than a few serums and this is the only one I haven't had a reaction to. It hydrates, and protects my skin from air pollution which irritates my skin. My skins texture has gone from dry, peeling, red, and irritated to soft and so much calmer. I can't believe the improvement. Thank you so much for providing this wonderful product. This oil saved my face! I have oily combo skin always but this fall I noticed my face starting to dry up and flake (never before has this happened) nothing helped. I read a lot of helpful reviews and purchased this product but very skeptical it would work, I was worried I would just look greasy and putting make up on would be pointless. How wrong I was. 3 days of using twice a day and my skin is feeling/looking so much better. No oily residue, absorbs perfectly, no smell, make up goes on just as well as before dry skin happened. I don't know how many bottles of this I've gone through since it launched but it's A LOT. I love this oil and I put it everywhere, especially in the drier months. I either use it alone or add a few drops to my facial moisturizer or hair product for a boost of hydration. I prefer squalane over other oils because of it's ease of absorption and stability when exposed to oxygen. Great oil! I tried the indie lee squalene and while it is slightly more lightweight than this one, I think for the price this is a great oil. Itâ€™s still lightweight and soaks in quickly but provides lots of moisture. I still use a lotion but I think in the summer you could do one or the other. Iâ€™ve used their rosehip oil and feel like this is a more lightweight version that actually moisturizes better and sinks in better than the rosehip. I also suffer from hormonal cystic acne and this doesnâ€™t break me out like the rosehip does. Iâ€™ve suffered from dry skin most of my life as well as it being sensitive to most products. This is the first product that actually seems to help A LOT and not just immediate relief, but long term relief. Other products seem to work when applying, but after a couple hours seems to be even more dry. Definitely worth the purchase, especially at such a low price. Excellent product. I got this to help combat dry skin in winter and so far it's really hydrating and keeping dry flakey skin at bay. I must say I'm pleased with all The Ordinary products I've ordered thus far. I decided to review this oil because it's one of my favourite. I use it after lighter more watery serums as an emolient and it does a great job moisturizing my very thirsty skin. I apply my cream after. It's also good as a carrier oil. I also use it on my nails. Although it's quite oily it sinks in well and doest simply sit on the skin but really sinks in, which is the almost humectant-like quality I am looking for since my skin is so darn dehydrated. So good at soothing my extremely dry facial skin. I've bought enough to last the entire winter. Great Price as well !!!! This is quite a heavy, greasy sort of oil. It's best to use it sparingly, and at night. I like to put a few drops into my cream and mix before applying to my face. These qualities aside, it's a very effective moisturizer and great for combating winter dryness. A real bargain, and a lifesaver!! This makes my skin feel so soft. Its quite oily, so I prefer it for nighttime, but i find if i put my regular cream moisturizer on top it feels less greasy. Used only for a week so far. Have used other face oils before. This one absorbs faster and moisturizes just as well. No fragrance which is a bonus! I use 1-2 drops together with other serum to keep my face from drying out, it lasts a long time, great product! This product keeps my face from drying out especially during the winter. It is an oil, but it's not as oily as some face oils. Just a few drops work so it lasts a long time. I only use it on non oily parts of my face. It has not given me break-outs like some reviewers. You can apply it as needed. Price point great for such a good hydrating serum for dry, sensitive skin. This is absolutely wonderful! I have very dry, dehydrated, rosacea-prone, very sensitive skin and Iâ€™m 40. I am not new to natural cosmetics, and I have never seen a product that makes a difference in one application. My skin has very seldomly felt this hydrated for so long. It looks plump and youthful. And omg for once it doesnâ€™t trigger rosacea outburst! And the price point! I am sold! Stock up everybody before they go on a rise and elevate their prices! I like this! It's not *quite* as lightweight as the Indie Lee Squalene, but for the price you can't beat it. I have very sensitive skin that is often dry. I've tried many sensitive-skin moisturizers in the past, but generally within half an hour my skin was dry again. This squalane product is different. My skin stays soft the entire day, and I haven't had a bad reaction to it. It's also lightweight and non-greasy, so my skin doesn't shine afterwards and it doesn't feel like it's being suffocated. So simple and fantastic. I have been having an issue with my skin the last year and this product has made a huge difference. Plus it doesn't aggravate my eczema! LOVE this. My favourite oil of all the types. So far I've used Argan and Rosehip from The Ordinary (and they are also great) but there's something about squalene! It's slippery, absorbs quickly and has no odour. My skin loves it! I've also used grapeseed oil, almond oil and coconut oil from other brands, but I'm a Squalane convert now. Ive been using this for just over a month, and while Im not sure if Im seeing actual results, I love the way this product feels. Its so light and not greasy and absorbs really fast. I use it twice a day. One drop for my face, and one drop for my neck and lips (my chapped lips have never been so soft, haven't used chapstick in a month). Ive been using this alone, without any other moisturizer and am surprised that it seems to be enough. This is great to add into your routine if you need extra hydration. A little goes a long way. Second time reviewing this. I canâ€™t edit my old comment about braking out of using it. I havenâ€™t again. I love this product. My skin feels so hydrated. I even use it on my 3 yr olds eczema and notice a difference. Been using this along with Niacinamide at night for approximately 3 weeks and can absolutely see a difference. My skin is better than ever, moisturized and soft. I only use at night because it makes my face very shiny (obviously, it's oil) Highly recommend! I normally have very dry flaky skin in the summer, I use a tiny bit of this serum before bed and wake up with soft glowy skin. Really love this product. The price is great too! Like all Ordinary brand products the amount of product you get or the price is incredible. VERY light and non greasy, almost texture of water in your hand. Great moisturizer for summer. I also use it on my hair but it is very light so it isn't quite what I thought it would be. A bit too light to use for frizz as I intended. It works so well under makeup! I use this Squalene with my Dermawand and it works fantastically! !